24% of U.S. high school students have seriously thought about attempting suicide. The ratio of suicide attempts to suicide death in youth is estimated to be about 25:1. More males than females are successful (by a factor of 4 because they use guns over pills). Teen depression is serious and there is a lot to know as a parent if you’re watching your teen suffer and want to prevent a crisis situation. ACT NOW. DON’T WAIT. You don’t have time to waste. Take an action now even if you think your teen isn’t in bad shape. That said: You likely know this. In fact it’s likely what brought you here. So first: Great work! You’re on the right path to getting your teen out of suffering. Still – you may be struggling with knowing what to do. Or, you may have tried to help, but you’ve been unsuccessful. If you’re looking for more strategies. Working with depressed teens can be a challenge. And very stressful. When your kid hurts (no matter what age), you hurt too. Often, teens can be stingy communicators. Some are embarrassed about their struggles. Some don’t know how to talk to their parents or close friends about tough situations they are dealing with. Teens have an advantage over older depression sufferers. They are young and have time to learn critical skills for dealing with challenges in life. Skills learned now can prevent a crisis during adulthood. As a parent or caregiver, it’s part of your job to train them. All the tools you need for helping them out of their depression and instilling strong mental health skills are here at Depression Zone. You first job is to educate yourself immediately. 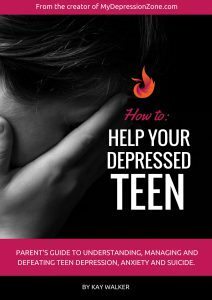 Grab this free checklist for parents with depressed teens. Do the checklist and review the actions to take. Next read our Start Here page. Knowledge is key and it will help you uncover new actions to take. Depression recovery map: A downloadable PDF that easily shows what causes depression with question assessment lists that will help you identify core issues so you can help your teen get into action.